I was up at walmart the other day and came across some lights I just couldnt pass up. They are made by Rally, there a 6in 100 watt halogen, I got em for $6 a piece. They didnt come with a wiring kit or anything. 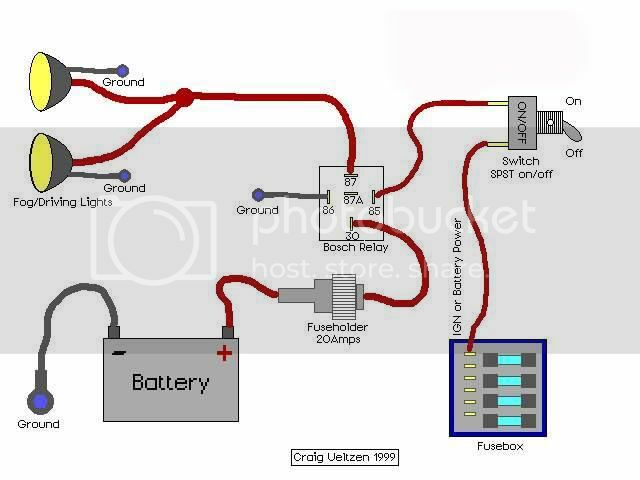 When it comes to wiring I aint the best with it so Im hoping for some help. Can anybody sugest a wiring kit from somewhere that I could use for these? In the instructions it says to wire them through the high or low beams and Im not wanting to do that, I was just wanting to put a switch inside the cab and turn them on and off whenever I want. Pretty simple. You can tie in to an existing 12 volt source, just make sure it is fused. From the fuse to an on/off switch of your choice and then to the lights. If the lights have 2 wires, one goes to the wire from the switch and the other goes to ground. Green or black to ground and the red one to the power. This is a really nice diagram that lays it out as simple as possible. good post. Once you start putting it together and seeing it in person it will all make sense.. also just remember electricity has to flow in a complete circuit. Guilty - What gauge wiring should I use and Im guessing that is an inline fuse? Also for that relay what kind should I get and where would I get one and then where at should I hook up the one side of the switch in the fuse box? You should be able to find something similar locally at a parts store. If you were closer, I`d help you install it! i would suggest mounting the relay to your radiator support. the relay your talking about is a double throw which means there are two cases where power will be on. dont worry about this, just leave the middle prong bare. 30 - constant 12 volt from the battery, when the relay is open this is the power that goes to the lights so use a 12 or 14 gauge wire. 87 - this is the other side of the 30 prong, the out to the lights so use the same size wire as you did for the 30 prong. 86 - goes to ground, the gauge on this side doesnt have to be as big at the previous two because it is only used to close the relay, which takes about .8 of an amp. something smaller like an 16 - 18 gauge will be plenty. 85 - this wire closes the relay which turns on the lights. i would suggest a switch on the dash board. one side of the switch needs to be hooked to the 85 side and the other wire from the switch can be hooked to an ignition wire. Alright that clears about everything up. I only got on more thing I think, now this may sounds stupid but I aint never messed with any of the electrical stuff in my truck before. But where would I find it and how would I hook it up to an ignition wire? An ignition wire is something in the cab of your truck, that only has power when the key is in the on position. Matsktr = Good to know that your an ace when it comes to this stuff, electrical is not my forte, thanks for your input! I only comment on what I`ve personally done myself. It took me like two weeks to figure how to hook up my Deville horns!